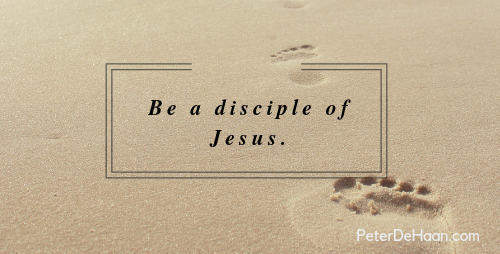 Should Christians Follow Jesus, Be a Disciple of Jesus or be a Missionary? By definition I am a Christian, but I’ve always shied away from that word. It means different things to different people, not all of which are positive. For too many, Christian is a negative label implying narrow minded, bigoted, or hate-filled people. Since these things make me cringe and don’t describe me, I typically avoid saying or writing the word Christian. Instead I say I’m a follower of Jesus. I could also say I’m a disciple of Jesus, but I’m wary of that for fear that I too often fall short. Others say that they’re missionaries for Jesus, which implies following him and being his disciple. But that label never clicked with me either. What insight does the Bible give us about which label we should use? Interestingly, the word Christian only appears three times in the Bible, twice in Acts and once in 1 Peter. People who know Greek tell me it means “little Christs.” It may have first been a derisive term (Acts 11:26 and Acts 26:28), which was later accepted by Jesus’s squad (1 Peter 4:16). But the fact that the Bible rarely uses Christian is telling. I wonder if we should avoid it too, especially given how emotionally laden this word has become. In the Bible, the idea of following Jesus occurs a lot in its various forms. This includes, they “followed him” (27 times), “follow me” (22), “followed Jesus” (5), and “following Jesus” (2). The command Jesus seems to give most often to people who approach him is to follow him. Though he sometimes says, “repent and follow me,” the idea of following implies a prior repentance. Think of repent as doing a U-turn; we must do a U-turn if we follow Jesus. Disciple, which means an “active adherent” or “someone who embraces and spreads the teachings of another,” occurs in the Bible a lot. It occurs nearly three hundred times in the New Testament, all in the four biographies of Jesus and the book of Acts. Disciple emerges as the preferred descriptive term in the Bible for those who follow Jesus, a.k.a. Christians. I suppose disciples refers to the early church, but church isn’t used nearly as often (114 times), mostly by Paul. Besides church is perhaps an even bigger misused and misunderstood term. In last week’s post on the Great Commission, which many see as a call to be a missionary, the word go emerges as the first action step. Missionary refers to someone who goes to persuade or convert others, but it doesn’t appear in the Bible at all. It’s a word we added after the Bible was written. I wonder if we should likewise avoid using it. That doesn’t mean being a missionary of Jesus isn’t biblical or is wrong, but it does imply it might be the wrong label. Let’s go back to the definition of disciple. A disciple is someone who embraces and spreads the teachings of another person, in our case Jesus. This means that as a disciple, we are by default a missionary—or at least we should be. Though we can call ourselves Christians or identify as part of the church, being a disciple of Jesus emerges as the most accurate, biblical, and appropriate label to use. Both following Jesus and being a missionary for Jesus are embedded in what it means to truly be a disciple of Jesus. I’m going to start making that mental shift from being a follower of Jesus to being a disciple of Jesus. Will you join me in this journey? It could change everything.